If you want a celebrity feel to your wedding, you can make a big hit with a Tiffany wedding cake. This will be a multi layered cake designed to resemble the famous Tiffany boxes. 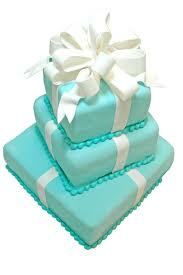 The layers of the cake can be frosted in aqua blue, the trademark Tiffany color. The layers can be either rectangular or square and finished with a wide white ribbon tied in a bow. There are two main ways of achieving the ribbon effect on each layer. First, if you want a bow on every layer of cake, then in order to stack the layers you will need to have the bow to the side. Alternatively, you can have a bow on the top layer only. Another idea is to offset the layers, having alternate layers set at an angle rather than square on the one below. This allows a bow to be placed on the corner. If you want to have the ribbon made of sugar paste then you will probably need the skills of a specialist cake baker. You can order from a cake maker who offers Tiffany wedding cakes in their online or offline catalog. You can expect to pay several hundred dollars for a professionally baked 4 or 5 tier Tiffany cake, but as the centerpiece of your reception room it can be a stunning sight that guests will never forget. If you prefer to make your own cake then you can use real ribbon for the bows and simply untie them before cutting the cake. You can surround the bottom layer with white sugar paste roses and have the traditional bridge and groom or other style of cake topper on the top layer. One of the more difficult points of creating a Tiffany style cake is making it appear that the boxes have lids. Our solution for this is to cover the whole layer or box in frosting once, let it set, then take an extra layer of frosting over the top and around the upper 1-2 inches of the sides. You will need to use something like a ruler or a sheet of card held against the side of the cake to create a straight line for the bottom of the 'lid'. The cake itself can be flavored however you like. Vanilla sponge with a buttercream filling works very well. You could have any fruit flavor or even a dried fruit cake although this would be a surprise to guests after the light and delicate appearance of the layers with their ribbon and bows. When you are planning a wedding there is plenty to occupy your time. One of the advantages of choosing a Tiffany style cake is its simplicity. Instantly recognizable and supremely elegant, a Tiffany wedding cake is a choice that you will not regret. Find out more about Edinburgh Wedding Cakes.